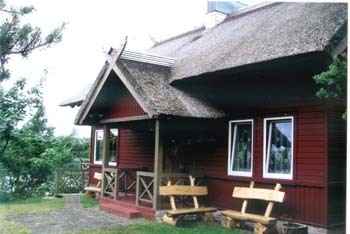 Hospitable ethnographic style houses are located on the bank of Beržoras Lake. There are four cottages, one for four persons, two for six persons and a log-cabin for two persons. All have a living room, bed rooms, kitchen and bathroom. Three of them are directly on the shore of the lake. You can rent one of the houses or a room in one of the houses. Welcome to Zemaitija National Park with its majestic Lake Plateliai and picturesque landscape including a great variety of unique natural, historical and cultural values.